Last October I spent a lot of time advising the team for a new BBC program on potential craftspeople they could visit as part of a series at that time billed as "Heritage at Risk". The program is now airing fronted by John Craven as "Heritage Heroes". They tour the country looking at buildings and traditions at risk and the people keeping those traditions alive. Last week was the Penines, next the border country along the Welsh Marches down to Bristol I think and then the final week will be along the south coast. Anyway last Thursday was the episode on the Peak district and they visited me and my friends at Portland Works in Sheffield. 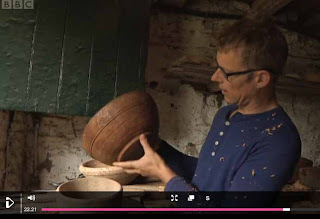 Here are a couple of screenshots, first of me waxing lyrical about an old bowl made by George Lailey about 70 years ago. and here is my mate Stuart Mitchell showing John Craven his knives. The episode is up on iplayer for a while, probably not available outside the UK I am afraid, this is the link and I am on around 21 mins in. TV is a funny thing, whilst 3 minutes of TV costs a huge amount to produce they very rarely pay the folk they film expecting you to give your time for the fame and glory. Another popular misconception is that a few minutes on TV bring fame and fortune, in reality the normal effect is a bunch of your mates phone and text saying they saw you on the telly but it rarely transfers into orders or increased business. 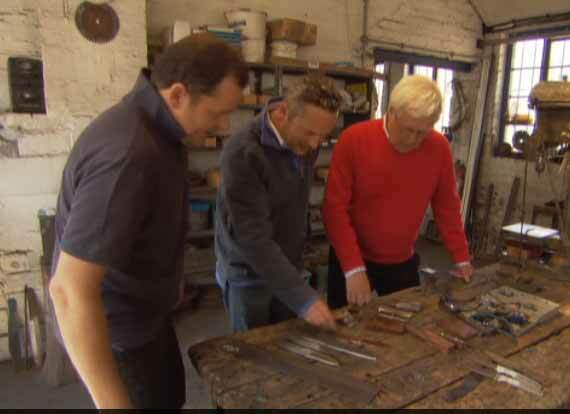 In Fact a good friend Hector Cole who does blacksmithing and used to do a lot of work for Time Team reckoned that it was actually bad for business as most of his customers assumed he would be too busy to want to sell them a few arrowheads. This series does seem to have been better than most with 4 or 5 bowl orders this week mentioning the program and it's always nice when you parents see you on the telly and think you have done good. Wow, how wonderful, thank you for the link. I had no Idea about this program as I don't own a T.V. I'm downloading all the other episodes now too, this will come in very handy for an essay I'm writing.